The image above is the EDSA LRT Station Map or LRT route. EDSA LRT Station is located between Baclaran LRT station and Libertad LRT station. 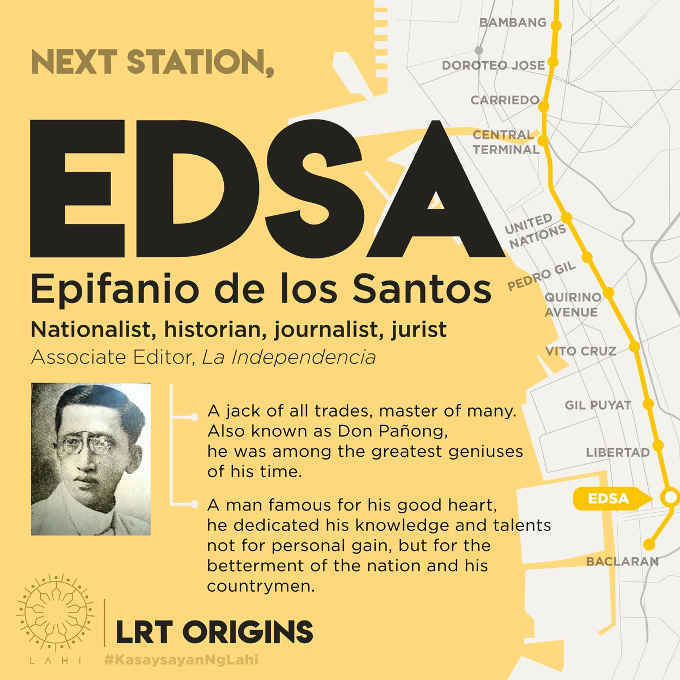 The EDSA LRT station was named after Epifanio de los Santos. Epifanio de los Santos is a nationalist,historian,journalist,jurist, and associate editor of La Independencia. Epifanio de los Santos is a jack of all trades, master of many. He is also known as Don Pañong. He was among the greatest geniuses of his time. Epifanio is a man famous for his good heart. He dedicated his knowledge and talents not for personal gain, but for the betterment of the nation (Philippines) and his countrymen.